What is sedimentation and sedimentation tank??? Sedimentation is a process used for various stages within a wastewater treatment plant to reduce the concentration of settleable and suspended matter. 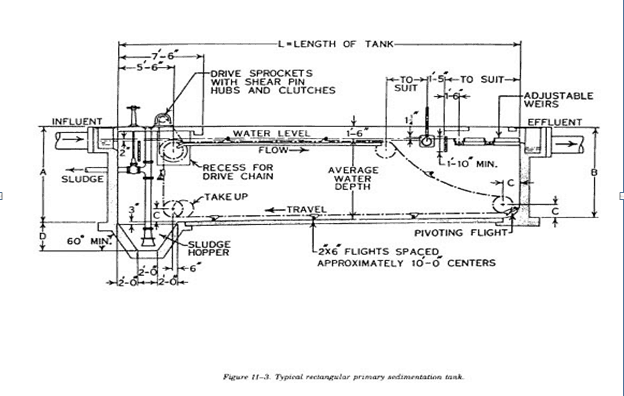 Sedimentation tanks, commonly referred to as clarifiers, are described as primary, intermediate and final clarifiers dependent upon the process stage. Primary clarifiers are installed to reduce organic loadings and floatables to the downstream treatment processes. Intermediate and/or final clarifiers are utilized after biological treatment processes to separate chemical and/or biological floc from the treatment process. Multiple units capable of independent operation shall be provided for plants having an average design capacity greater than 0.1 MGD unless temporary removal of a single unit from service for repairs will not result in an adverse effect to the quality of the receiving stream. Clarifiers shall be arranged to facilitate operating flexibility and maintenance, assure continuity of treatment, and ease of installation of future units. Provision shall be made for dewatering and bypassing each unit independently process units. Effective flow measurement devices and controls shall be provided to permit proper flow distribution to each unit. Due consideration shall be given to the possible need for hydrostatic pressure relief devices to prevent structure flotation. Power Point Presentation has been embedded below for better understanding.